First impression with Voice Interaction - ReSpeaker, play music! 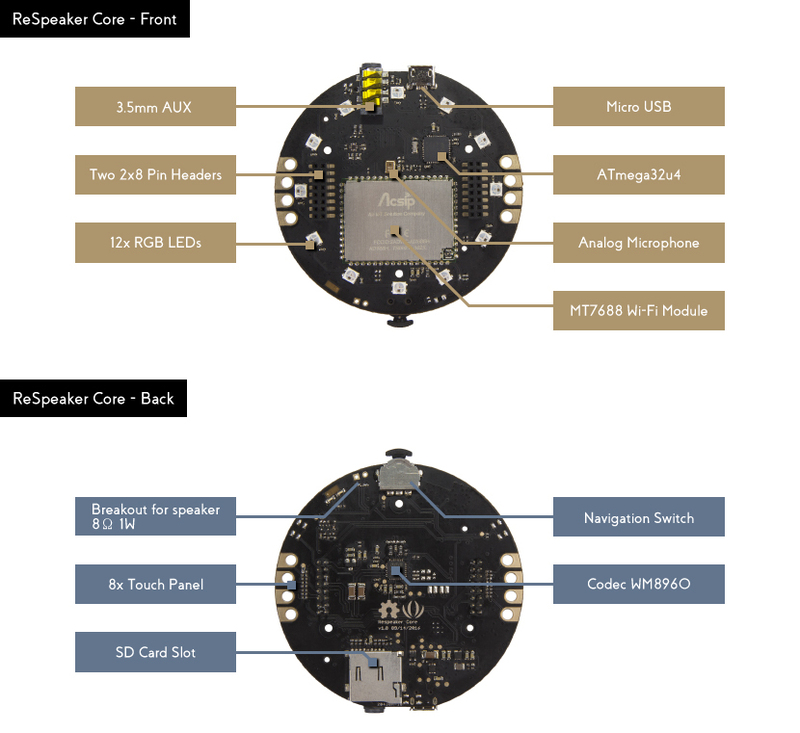 ReSpeaker is an open modular voice interface to hack things around you. Let you interact with your home appliances, your plant, your office, your internet-equipped devices or any other things in your daily life, all by your voice. ReSpeaker supports both online cognitive services and offline lightweight speech recognition engine. You can add ReSpeaker to things around you to make them smart(smarter). Voice interface has never been apart from music entertainment, so does ReSpeaker. ReSpeaker supports Airplay/DLNA for wireless music streaming. Just connect ReSpeaker to any ordinary speaker with an AUX cable, then you can start enjoying the music you love without pressing a single button. 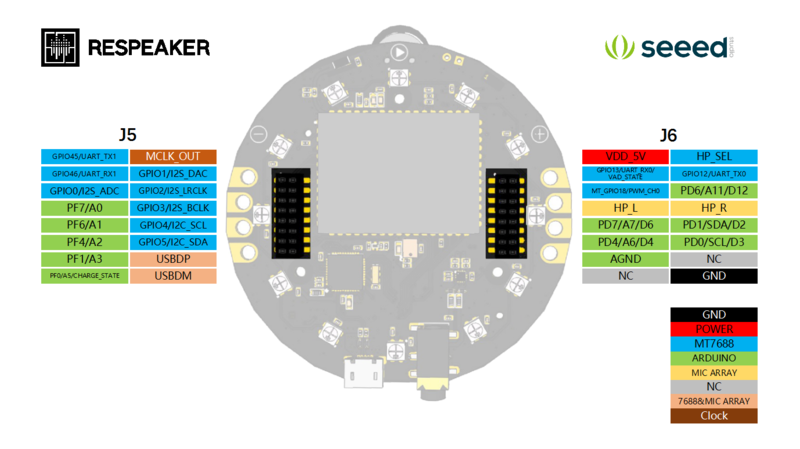 Rather than the on board MT7688 Wi-Fi module which runs the Linux based OpenWrt, ReSpeaker is also powered by the ATmega32u4 chip and absolutely Arduino compatible, which means, we can use ReSpeaker as a powerful Arduino board and do many ‘Arduino’ things. It’s for learning, it’s for practicing, and it’s for fun. Growing Features: Download and plug-in to enrich its features and functionalities. Plug-n-play Add-ons: Extendable with Mic Array, Grove Extension Board, Grove Modules. 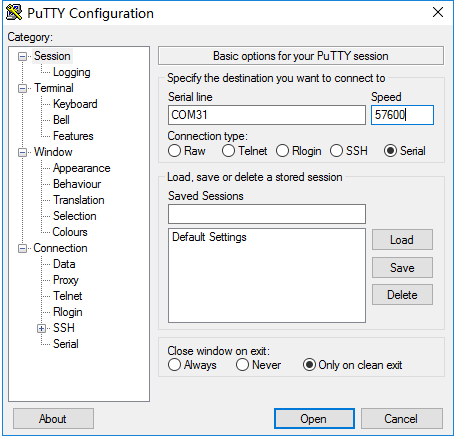 For Windows, putty is recommended. 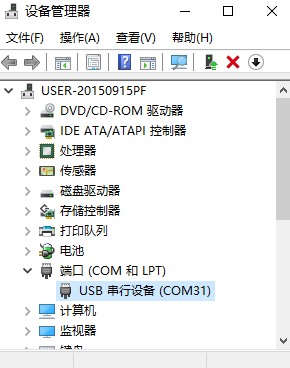 Connect ReSpeaker to your PC via USB, check "Device Manager" for COM port. Here my ReSpeaker COM port is COM31. Select Serial under Connection type. In the Serial line field, enter the COM port for your ReSpeaker. In the Speed field, type 57600. Click Open. When you see a blank screen, press the Enter key. Type ls /dev/tty.usb* in the Terminal. We should see a list of devices. Look for something like tty.usbmodemXXXXX where XXXXX is usually a random identifier. This is the serial device used to access the system console. Then Use the screen utility to connect to the serial port and set the baudrate to 57600. This is because the baudrate of the system console is 57600 by default. 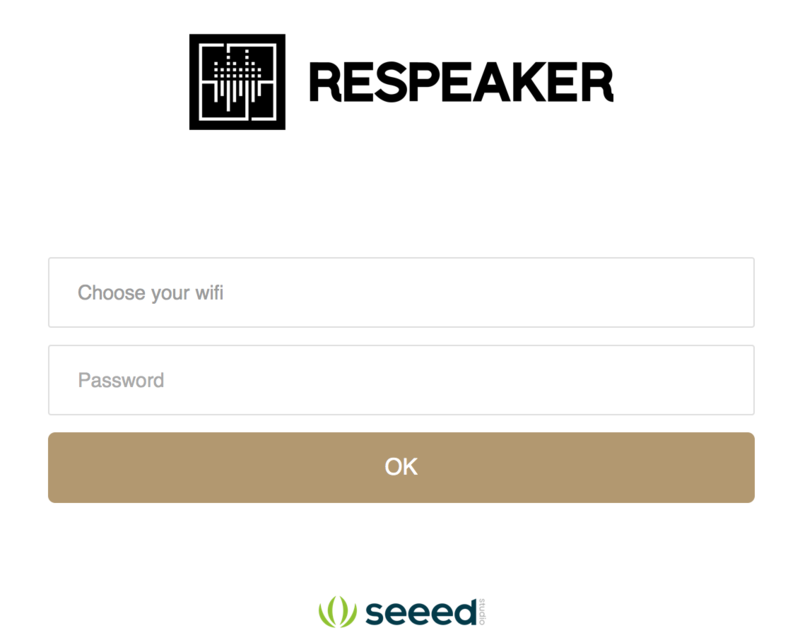 ReSpeaker is set to Repeater Mode as default, and you have to connect it to an existing wireless network before enjoying the speech recognition with the Internet. When you first power on ReSpeaker, it will create a Wi-Fi network called "ReSpeakerXXXXXX". Here "XXXXXX" is the last 6 of your ReSpeaker MAC address, which is marked on the board. Connect your computer to this network. If "ReSpeakerXXXXXX" does not appear, but "LinkIt_Smart_7688_XXXXXX" is found. Please click here. Once you've obtained an IP address, open a web browser, and enter 192.168.100.1 in the address bar. After a few seconds, a web page will appear asking for ssid and password of an existing Wi-Fi network. Select the Wi-Fi you wish to connect to and enter the password. When you press the OK button, ReSpeaker will join the specified network. Now your ReSpeaker is able to visit the Internet. Also, here is other way to setup Wi-Fi with command line. We can use wictl to scan the wifi and connect it. If you can't connect Wifi with above methods, please do the factory reset by entering firstboot command. After the Wifi function being enabled, we can use SSH to connect Respeaker by below command. We can get the Respeaker IP address from http://192.168.100.1/#!/overview WAN IP. The password is root. More often than not, a limited amount of storage is available on embedded devices(ReSpeaker has only 5M on-board flash storage left for users). More storage for applications and data can expand ReSpeaker's potential, so use SD card to extend storage as an extroot is a good choice. By employing extroot, expansion of the storage capacity of your root file system is accomplished by using an added storage device. During the boot process, external storage space is mounted as the root file system, or in an overlay configuration over the original file system. Make sure your SD card is plugged into ReSpeaker and /dev/mmcblk0p1 can be detected by df -h or ls /dev. Format your SD card into two partitions, one is FAT32, the other is EXT4. EXT4 file system will be as an extroot while FAT32 will be as a normal storage device, which is able to transfer files between ReSpeaker and your PC. >The partition table has been altered. >octl() to re-read partition table. Prepare your external storage root overlay. Create fstab with the following command. This command will create a fstab template enabling all partitions and setting '/mnt/mmcblk0p2' partition as '/overlay' partition. Check if it is mountable to overlay. Reboot ReSpeaker and check again. If SD card is mounted automatically, you are done. More informations about extroot, please click here. After extending storage with a SD card, there are enough storage to install software on ReSpeaker. With Bing Speech API, ReSpeaker can turn on and recognize audio coming from the microphone in real-time, or recognize audio from a file. After "INFO:mic:Start Detecting" coming out, try to say "ReSpeaker" to wake up the program, and say "play music" to let it play music. Then ReSpeaker will play "Tchaikovsky_Concerto_No.1p.mp3" in the current path with madplay tool. If you see below error code, the mopidy is running in background and is using the USB device. So try to run /etc/init.d/mopidy stop mopidy and run your command again. Try `madplay --help' for more information. 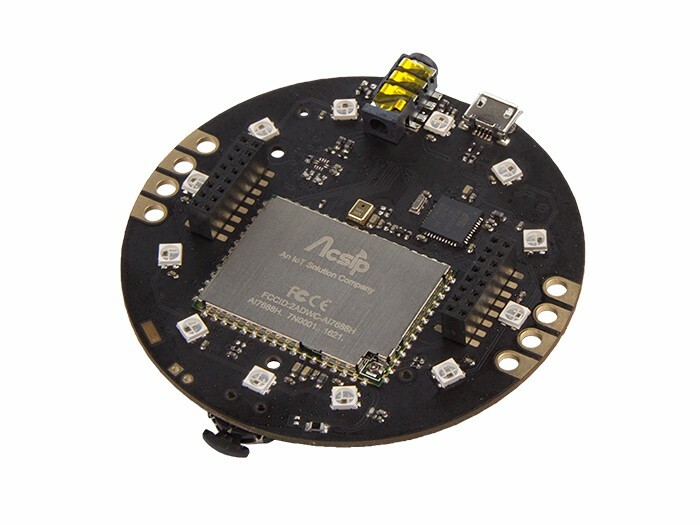 Rather than the on board MT7688 Wi-FI module which runs the Linux based OpenWrt, ReSpeaker is also powered by the ATmega32u4 chip and it’s absolutely Arduino compatible, which means, we can use ReSpeaker as a powerful Arduino board and do many ‘Arduino’ things. It’s for learning, it’s for practicing, and it’s for fun. For example, you can program it with Arduino IDE to have a special DIY piano that is built on 8 cherry tomatoes connecting to the 8 touch sensors of ReSpeaker. Weather Cloud is an awesome project for ReSpeaker. 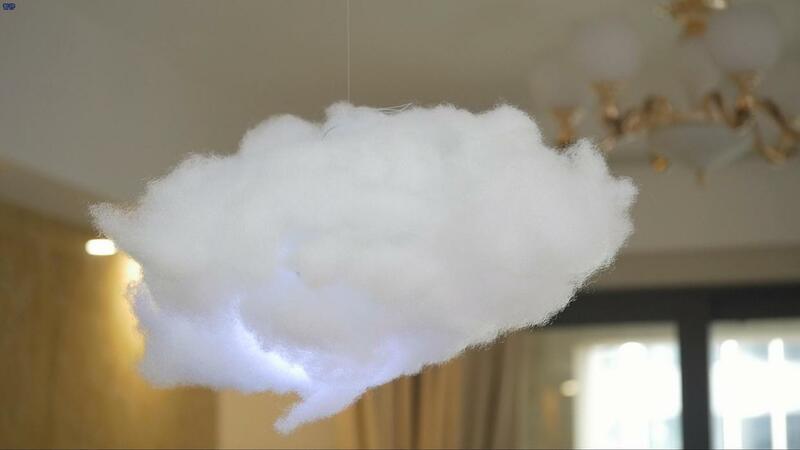 This cool build turns a ReSpeaker into a Weather Cloud, which is able to show you the whether with vivid light and sounds. In this project, Openwrt is in charge of getting realtime weather information from the Internet, making voice interaction and audio output, while Arduino is responsible for controlling the colorful RGB LEDs. Get OpenWeatherMap appid from here and copy it to appID = "" in main.py, don't forget to add your city in city=""
Run python main.py and say "ReSpeaker, what is the weather like?" to ReSpeaker. For more details about how to make a Weather Could, please click here. The ReSpeaker Mic Array can be stacked (connected) right onto the top of ReSpeaker Core to significantly improve the voice interaction experience. It is developed based on the XVSM-2000 Smart Microphone from XMOS. The board integrates 7 PDM microphones to help enhance ReSpeaker's acoustic DSP performance to a much higher level. ReSpeaker is an open project to create voice enabled objects. ReSpeaker python library is an open source python library to provide basic functions of voice interaction. It uses PocketSphinx for keyword spotting and uses webrtcvad for voice activity detecting. Q1: How to do Factory Reset? Open the serial console or a ssh session and run firstboot. More detail. Q2: How to Rescue from a failed upgrade? 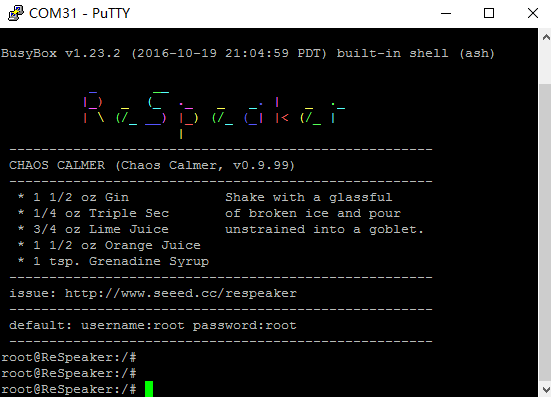 When the respeaker failed to boot into its openwrt system, we can't access the system through web terminal, ssh or serial console. We can follow Rescue instruction to recover it. And the Wi-Fi Channel 12 is not supported by ReSpeaker. Make sure your router is not using that channel. We advise you to configure Wi-Fi via WEB-UI and if it can't be used, try command line tool wictl at the serial console. If you don't need to change the wake up words, just change text = bing.recognize(data) into text = bing.recognize(data,language="zh-CN") is fine. More details. Q6: Got SD card warning message "Volume was not properly unmounted. Some data may be corrupt. Please run fsck"
If the files on the SD card are fine, ignore it. Otherwise, try to format it with sd card formatter. Re-flash the bootloader on openwrt. Q9: How to support google speech or other Speach TO Text(STT) Engine? Q10: Failed to run Alexa with error "IOError: [Errno -9998] Invalid number of channels"
There is another application or alexa instance using the audio input device. Run /etc/init.d/alexa stop and /etc/init.d/mopidy stop to stop them. To disable mopidy to startup, run /etc/init.d/mopidy disable. It should be that mopidy is running in background and is using the USB device. try to run /etc/init.d/mopidy stop to stop mopidy and run your command again. Q13: SFTP & FTP - We don't have a FTP on respeaker, just SFTP. Try to update the arduino code. Q15: How to disable 'ap' mode - We could set the 'ssid' flag of the 'ap' interface to '' at vi /etc/config/wireless. Then the ap will be hidden. Q16: I2C Sound card issue - We need check codec driver compatible name and codec i2c address. Then rebuild the image firmware. Q17: Respeaker is often wakeup even no voice. We can reduce the false positive rate by increase the threshold in the keyword.txt, but it also reduce the sensibility. Another way is to adapt your voice with current acoustic module, more detail via http://cmusphinx.sourceforge.net/wiki/tutorialadapt. It will effectively improve individual keyword recognition, but may make the recognizer less general. Q18: How to control GPIO pins from respeaker? Q19: How to change wake up word? respeaker is a keyword, 1e-30 is its threshold. To improve sensitive, we can decrease the threshold, for example, 1e-50. We should know decreasing the threshold will increase False Acceptance Rate. The first part is a name (respeaker, alexa or music), the second part is its phonemes. You can find words in a large dictionary at here. Q20: System recovery by factory image. Note: If you can not update your ReSpeaker via Web or can not visit http://192.168.100.1/home.html, please click here. to download the lastest firmware on your computer, copy it to a SD card and plug the SD card into ReSpeaker. It will cost about 3 minutes for ReSpeaker to install the firmware and reboot, please don't turn off ReSpeaker when updating.